Born in Torun in 1473, Nicolaus Copernicus would become one of the greatest minds to come out of Poland. His book, De Revolutionibus Orbium Coelestium, is the cornerstone of our understanding of how the solar system works and his theories on economics are still relevant in modern times. So it came as no surprise when Mayor John Kopczynski of North Tonawanda suggested that a monument to the Polish astronomer should be raised in the city at a 1959 speech before the Central Council of Polish-American Organization. Laying out his argument at the Dom Polski, Kopczynski stated, “An action such as this will not only contribute to the cultural aspect of our community, but indeed will be very timely, in that we are now entering the space age. This statue should be inscribed to remind all that the success of our space satellites in reality is based on astronomical formulas that were conceived centuries ago. This would prove to our children and our children’s children that complex scientific challenges are nothing to be feared, for in reality progress is based on the sum total contributions of many people from many lands throughout the centuries.” To start the effort, Kopczynski set aside $250 for the statue. Progress in the early years was slow, so the Central Council began a major fundraising campaign in 1967 with Kopczynski donating another $250 to get the ball rolling. With that little push the effort to erect the monument was soon in full swing. By the fall the coffers were growing and site locations were being discussed. Two sites proposed early on were Brauer Park and the Botanical Gardens, but neither one raised much excitement in the community. What did excite Polonia was the model of the proposed Copernicus monument that began being displayed in late 1967. With something that could be seen and touched, the project became real in the eyes of many of Western New York’s Poles and the donations soon came pouring in. The Adam Mickiewicz Library and Dramatic Circle, the Polish American Congress Western New York Division, Frank Wardynski & Sons, the Polish Cadets, and the Kolko Polek of Buffalo gave money. So too did the Polish National Alliance, Congressman Thaddeus Dulski, Stanley Brzezinski the Town of Wheatfield Supervisor, and scores of Polish citizens from North Tonawanda. By the summer of 1968, $3,194.73 of the $6,000 project had been raised. A site at the North Tonawanda High School was agreed upon and the carving of the monument had begun. The September 8th date was chosen as it was the thirtieth anniversary of the founding of the Central Council of Polish American Organization. A grand dinner and party were held at the Dom Polski on the 8th but the base of the monument suffered a crack during shipment which pushed the formal unveiling back to October 27. The location on the North Tonawanda campus has been both a blessing and a curse. Many student organizations have take up beautifying and maintain the monument over the years. Equally some students have found taking the bust of Copernicus makes for a good prank. Because of this the statue is kept inside the school building. 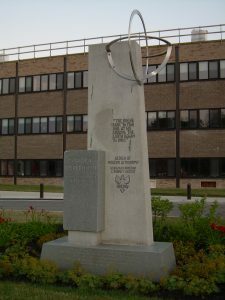 "Cable Snaps, Damaging Monument to Copernicus." Tonawanda [Tonawanda, NY] 4 Sept. 1968: 7. Print. "Cafeteria Considered For NT's Gilmore School." Tonawanda News [Tonawanda, NY] 17 Jan. 1969: 7. Print. "Central Council Renews Drive For Copernicus Statue Fund." Tonawanda News[Tonawanda, NY] 18 Jan. 1968: 6. Print. "Central Council to Note 40th Year." Tonawanda News [Tonawanda, NY] 16 Aug. 1978: 2. Print. "'Citizen of Year' Is Termed Tonawandas Quality Example." Tonawanda News [Tonawanda, NY] 13 June 1968: 1. Print. "Class Gift." Tonawanda News [Tonawanda, NY] 26 May 1980: n. pag. Print. Conner, Shirley. "Vandalism Clouds Copernicus Case." Tonawanda News [Tonawanda, NY] 8 Jan. 1976: n. pag. Print. 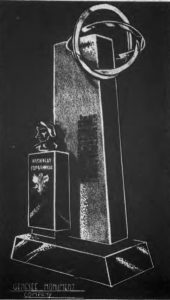 "Copernicus Monument Erected." Tonawanda News [Tonawanda, NY] 11 Oct. 1968: 20. Print. "Copernicus 'new Lease on Life'" Tonawanda News [Tonawanda, NY] 10 Jan. 1976: 2. Print. "Copernicus Unit Meets Tonight." Niagara Falls Gazette [Niagara Falls, NY] 5 Nov. 1967: n. pag. Print. "Copernicus Unveiling On Oct. 27." Niagara Falls Gazette [Niagara Falls, NY] 19 Oct. 1968: 10. Print. "Fund Set Up To Erect Statue Of Copernicus." Tonawanda News [Tonawanda, NY] 20 Feb. 1967: 11. Print. Hemmings, Lynn. "Monument to Copernicus To Be Unveiled on Sept. 8." Tonawanda News [Tonawanda, NY] 22 July 1968: 9. Print. "Jasinski Guest Speaker For Copernicus Fete." Tonawanda News [Tonawanda, NY] 24 Jan. 1968: 6. Print. Leaders, Founders Honored By Polish Central Council." Tonawanda News [Tonawanda, NY] 9 Sept. 1968: 5. Print. “More Donations Reported For Copernicus Memorial." Tonawanda News [Tonawanda, NY] 6 Sept. 1968: 9. Print. "More Donors For Copernicus Statue Listed." Tonawanda News [Tonawanda, NY] 23 Jan. 1968: 7. Print. "Mrs. Wieloszynski Dies; Active Citizen." Tonawanda News [Tonawanda, NY] 29 Mar. 1973: 9. Print. "NT Mayor Proposes Statue Honoring Polish Astronomer." Tonawanda News [Tonawanda, NY] 31 Jan. 1959: 10. Print. "Polish Bishop Visits." Tonawanda News [Tonawanda, NY] 18 Aug. 1976: 1. Print. "Polish Society Proposes Sites For Copernicus." Tonawanda News [Tonawanda, NY] 11 Oct. 1967: 15. Print. "Thieves Take Statue's Head, Lawn Figures from NT Sites." Tonawanda News [Tonawanda, NY] 17 May 1985: n. pag. Print. "To View Model." Tonawanda News [Tonawanda, NY] 15 Nov. 1967: 15. Print.